Curators of oral storytelling series in the UK discuss how the form is a reaction to our increasingly digital world — and how it intersects with publishing. Read one I wrote earlier….my headline article for the New York’s Publishing Perspectives in full below or by clicking on this link. Publishing Perspectives is a project of The Frankfurt Book Fair. While it is hard to dissociate the words of storytellers from the images accompanying a children’s nursery rhyme or even Tolkien, from New York to London there appears to be a renaissance in oral personal storytelling going on that offers an experience so profound that couples often meet at their open mic nights. “The great yarn is the oldest art form in the world. It comes from the cave right up to today,” says Sarah Bennetto, professional storyteller, comedian and founder of the Storytellers’ Club, where such comedians as Russell Howard and Sarah Milligan go to tell stories in venues as far apart as the Edinburgh Fringe and Melbourne. Over the last few years Bennetto’s Storytellers’ Club has grown from “a 50-seater theatre, to 120 and now a 300-seater,” and she sees that as evidence of the oral storytelling renaissance – although similar claims have been made over the last 20–30 years. Chip Colquhoun, artistic director of Snail Tales and company secretary of the UK-based Society for Storytelling, agrees that there has been “an upsurge of storytelling,” as it is considered important by a wide range of organizations such as schools, video game designers and advertising agencies. Storytelling for Colquhoun is basically the “oral transmission of a story. However, he believes that it can be divided between traditional storytelling, which is often about something that happens to someone else which we take and pass on, and the storytelling that takes place in clubs like Bennetto’s, where individuals are often sharing their own experiences crafted into a story. He assures me that both types of storytellers get on. Sarah Austin Jenness, producing director of The Moth, agrees with Bennetto that there is “great interest” in personal storytelling as a movement right now.” The Moth is a not-for-profit storytelling organization based in New York and now also running nights in Ireland, the UK and even Kenya for professional and amateur storytellers, each of whom works with directors before they get to tell their story. Nail Gaiman and Salman Rushdie are among the professionals who have told their stories there. Capturing “stories that were born live” in a printed book was a challenge. “We picked 50 stories out of 300 to become highly edited transcripts” and worked closely with the original storyteller, who keep ownership of their story. She believes “you can really hear the storyteller’s voice” coming through. Michael Bhaskar, digital marketing director at Profile Books, is more hesitant to call this a renaissance. 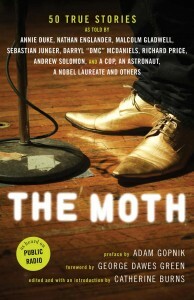 Profile owns Serpent’s Tail, which publishes The Moth in book form in the UK. It’s the same reason he believes that music festivals, adventure holidays and the theatre have flourished in the digital age – “people want pure and unmediated experiences in an age of saturation. We want something real, whatever that means, not something fake or contained by a screen. “Perhaps on top of that there is also a sense, spurred on perhaps by the democratizing of publishing on the Web, that storytelling is something for everyone. It’s not just an elite art for novelists with English degrees – it’s something everyone has a stake in,” and everyone can do. Apart from The Moth this year, for example, Serpent’s Tail is also publishing two books next year that are largely comprised of interviews. One is a book about work,All Day Long, by a young writer called Joanna Biggs, who travelled all over Britain interviewing people from all walks of life about their jobs, creating a portrait of who we are through what we do. The other is The Sexual Fantasies of English Women, for which author Wendy Jones interviewed 25 diverse women about their sexual lives and desires. In the end Jenness feels that “there is a real hunger for [storytelling], and the possibilities are endless.” The Moth is committed to the US and Britain, and Jenness has only recently come back from Kenya, where she was running classes on how to tell your own story. Next The real drone revolution will be the micro-drone revolution.